Knicks starting point guard Raymond Felton was arrested on Tuesday morning and faces three counts of criminal firearm possession. Initial reports claimed Felton was arrested for pointing a gun at an unidentified woman. However, a New York police spokesman clarified that Felton is facing second, third and fourth degree criminal charges because the weapon is not registered and not for any threatening actions. Felton turned himself in to the 20th Precinct on the Upper West Side of Manhattan at 12:50 a.m. The Knicks played earlier in the evening, losing to the Dallas Mavericks 110-108. At press time, Felton has not released an official statement on the matter. There are a lot of crass jokes that can be inserted about this situation (namely the idea that Felton could shoot with any accuracy). With that said, this is definitely not a laughing matter — New York gun laws are among the strictest in the United States and a person’s celebrity won’t save them. We all remember the famous case of Giants receiver Plaxico Burress receiving a 3.5 year sentence despite shooting himself by accident in a New York City nightclub back in 2009. 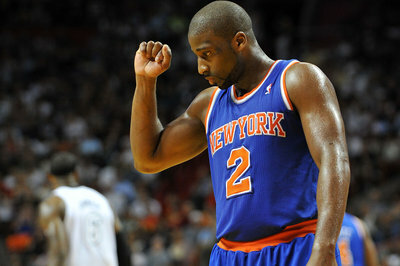 Any sane Knicks fan wants Felton gone, but most of us would like the man to keep his freedom. If this does result in time away from the team, one positive is that Coach Woodson would literally have no choice but to play Toure Murry.